Dystrophin protein is integral to the structural stability of the myofiber. Without dystrophin, muscles are susceptible to mechanical injury and undergo repeated cycles of necrosis and regeneration. Duchenne and Becker muscular dystrophies are caused by mutations in the same gene encoding dystrophin. These disorders almost exclusively affect males because of the X-linked inheritance pattern. See the image below. (A) Normal dystrophin staining. (B) Intermediate dystrophin staining in a patient with Becker muscular dystrophy. (C) Absent dystrophin staining in a patient with Duchenne muscular dystrophy. Progression of muscular dystrophy occurs in 5 stages. In stage 1, creatine kinase levels are usually elevated. Patients have a positive family history. No cure yet exists for Duchenne or Becker muscular dystrophy, but medical and supportive treatments can reduce morbidity, improve quality of life, and prolong lifespan. TREAT-NMD has published standards of care for Duchenne muscular dystrophy. Duchenne muscular dystrophy (DMD) is the most common muscular dystrophy affecting 1 in 3500 boys born worldwide. Although the name Duchenne is inextricably linked to the most common childhood muscular dystrophy, it was Gowers who recognized Sir Charles Bell for providing the first clinical description of Duchenne dystrophy in his 1830 publication, The Nervous System of the Human Body. Others, including Edward Meryon in 1852 and John Little in 1853, described families of boys with delayed motor milestones, calf enlargement, progressive inability to ambulate, heel cord contractures, and death at an early age. In an 1868 publication, Duchenne established the diagnostic criteria that are still used. These criteria include (1) weakness with onset in the legs; (2) hyperlordosis with wide-based gait; (3) hypertrophy of weak muscles; (4) progressive course over time; (5) reduced muscle contractility on electrical stimulation in advanced stages of the disease; and (6) absence of bladder or bowel dysfunction, sensory disturbance, or febrile illness. Gowers was the first to deduce the genetic basis for the disease and the first to describe patients with delayed onset of disease. In 1962, Becker proposed that the less symptomatic patients reflected milder mutations in the same gene. These patients are now classified as having Becker muscular dystrophy (BMD). Another similar 395-kd protein, known as utrophin, has also been identified. This protein has a similar structure to dystrophin and seems able to perform some of the same functions. Despite there being no cure for the dystrophinopathies, knowing the genetic cause and related functions of dystrophin has been invaluable in creating new molecular and pharmacologic techniques for diagnosis and treatment. Dystrophin protein is integral to the structural stability of the myofiber. Without dystrophin, muscles are susceptible to mechanical injury and undergo repeated cycles of necrosis and regeneration. Ultimately, regenerative capabilities are exhausted or inactivated. In the 1850s, Edward Meryon used a small harpoon-like device to perform muscle biopsies and described the tissue from an affected patient: "The striped elementary primitive fibers were completely destroyed. The sarcous element being diffused, and in many places, converted into oil globules and granular matter, whilst the sarcolemma or tunic of the elementary fibre was broken down and destroyed." In order to understand how a mutation in the gene can cause such devastation, accurate conceptualization of the structure of dystrophin is necessary. Dystrophin protein is encoded by the largest gene described to date. It occupies almost 2% of the X chromosome and nearly 0.05% of the entire genome. The gene consists of 79 exons and 8 promoters spread over 2.2 million base pairs of genomic DNA. It is expressed mainly in smooth, cardiac, and skeletal muscle, with lower levels in the brain. In muscle, dystrophin is expressed as a 427-kd protein that consists of 2 apposed globular heads with a flexible rod-shaped center that links the intracellular actin cytoskeleton to the extracellular matrix via the dystroglycan complex. The protein is organized into 4 structural domains including the amino-terminal actin-binding domain, a central rod domain, a cysteine-rich domain, and a carboxy-terminal domain. Its amino terminal end insinuates with the subsarcolemmal actin filaments of myofibrils, while cysteine-rich domains of the carboxy-terminal end associate with beta-dystroglycan as well as elements of the sarcoglycan complex, all of which are contained within the sarcolemmal membrane. 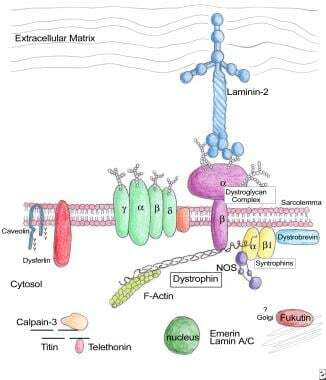 Beta-dystroglycan in turn anchors the entire complex to the basal lamina via laminin. Structure of the dystroglycan complex (adapted from Ozawa et al). The molecular organization of integral and peripheral components of the dystrophin-glycoprotein complex and novel proteins involved in muscular dystrophy in skeletal muscle. Deletions or duplications of the dystrophin gene that do not disturb the reading frame may lead to minor alterations in the protein structure, and by extension, the function of dystrophin, particularly if in-frame changes are located within the amino-terminal or central regions. In contrast, mutations that disturb the reading frame, including premature stop codons, produce a severely truncated, completely dysfunctional protein product or no protein at all. 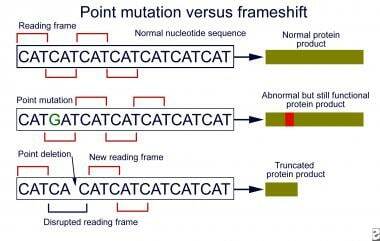 Point vs frameshift mutations. In contrast to most point mutations, which generally preserve the reading frame, frameshift mutations often lead to truncated protein products. The functional loss of dystrophin protein initiates a cascade of events, including loss of other components of the dystrophin-associated glycoprotein complex, sarcolemmal breakdown with attendant calcium ion influx, phospholipase activation, oxidative cellular injury, and, ultimately, myonecrosis. Microscopic evaluation in the early stages of the disease reveals widespread myonecrosis with fiber splitting (see image below). Interspersed between the dying myocytes are ghost cells, the shells of formerly healthy tissue. 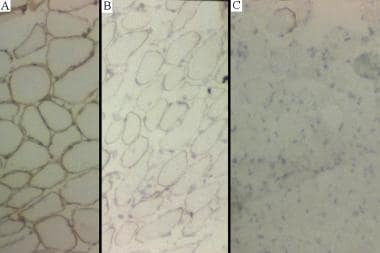 Inflammatory cell infiltration of the necrotic fibers may be observed in particularly aggressive areas of muscle biopsies. Fibers that survive exhibit considerable variability and often demonstrate internal nuclei. As the disease progresses, dead muscle fibers are cleared away by macrophages and replaced by fatty and connective tissue elements, conveying a deceptively healthy appearance to the muscle (pseudohypertrophy), especially calves and forearms. 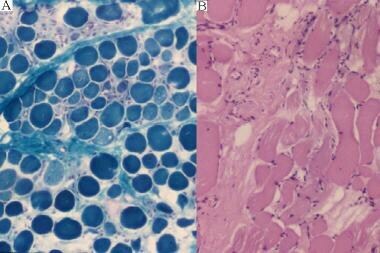 Dystrophic muscle (A = Gomori trichrome; B = hematoxylin and eosin [H&E] stain). Duchenne muscular dystrophy is by far the most common childhood-onset muscular dystrophy, afflicting 1 in 3300 boys with an overall prevalence of 63 cases per million. The prevalence of the Becker phenotype is 24 cases per million. One third of these cases are due to spontaneous mutations, while the rest are inherited in an X-linked dominant manner. Gonadal mosaicism accounts for approximately 20% of new Duchenne muscular dystrophy cases. Duchenne muscular dystrophy is much more than a disease of skeletal muscles. Dystrophin is also found in the heart, brain, and smooth muscle. Late-stage cardiac fibrosis can lead to output failure and pulmonary congestion, a common cause of death. Additionally, cardiac fibrosis can include cardiomyopathy and conduction abnormalities, which can induce fatal arrhythmias. Weakness of skeletal muscle can contribute to cardiopulmonary complications. Scoliotic deformity from paraspinal muscle asymmetric atrophy impairs pulmonary and gastrointestinal function, predisposing individuals to pneumonia, respiratory failure, and poor nutrition. Smooth muscle dysfunction as a result of abnormal or absent dystrophin, plus inactivity, leads to gastrointestinal dysmotility, causing constipation and diarrhea. In general, patients with Becker muscular dystrophy have much greater phenotypic variability; patients may become wheelchair bound as early as age 20 years or as late as age 70 years. Motor dysfunction usually is at least a decade later than in Duchenne muscular dystrophy. Once wheelchair bound, patients with dystrophy become much more susceptible to the scourges of the sedentary, which include scoliosis, contractures, decubitus ulcers, and impaired pulmonary function. Cardiomyopathy also occurs in patients with Becker muscular dystrophy, and conduction abnormalities may dominate the clinical picture, necessitating medications, implantation of a defibrillator, or even evaluation for heart transplant. Although significant advances have been made in understanding the molecular underpinnings of the disorder, Duchenne muscular dystrophy remains an incurable illness with a mortality rate of 100%. Like its clinical presentation, the prognosis of patients with Becker muscular dystrophy is variable, with patients who are less affected ultimately dying of other diseases after a near-normal life span. Duchenne and Becker muscular dystrophy almost exclusively affect males because of the X-linked inheritance pattern. Rarely, skewed random inactivation of healthy copies of the X chromosome leads to the Becker/Duchenne phenotype in females who carry the dystrophin mutation. Females with Turner syndrome (XO) or uniparental disomy or those who have translocations between the X and autosomal chromosomes may similarly manifest the Duchenne phenotype. Elevations of creatine phosphokinase (CPK) level are found in two thirds of female carriers, the vast majority of whom are clinically asymptomatic. Duchenne muscular dystrophy clinically manifests in patients aged 3-7 years, with development of lordosis, a waddling gait, and the Gowers sign. Calf pseudohypertrophy follows 1-2 years later. Most patients are wheelchair bound by age 12 years. Becker muscular dystrophy follows a much more variable course, manifesting any time from age 3 years to late adulthood. Bushby K, Straub V. Nonmolecular treatment for muscular dystrophies. Curr Opin Neurol. 2005 Oct. 18(5):511-8. [Medline]. Moxley RT 3rd, Ashwal S, Pandya S, Connolly A, Florence J, Mathews K, et al. Practice parameter: corticosteroid treatment of Duchenne dystrophy: report of the Quality Standards Subcommittee of the American Academy of Neurology and the Practice Committee of the Child Neurology Society. Neurology. 2005 Jan 11. 64(1):13-20. [Medline]. Ervasti JM, Campbell KP. Membrane organization of the dystrophin-glycoprotein complex. Cell. 1991 Sep 20. 66(6):1121-31. [Medline]. Ozawa E, Noguchi S, Mizuno Y, et al. From dystrophinopathy to sarcoglycanopathy: evolution of a concept of muscular dystrophy. Muscle Nerve. 1998 Apr. 21(4):421-38. [Medline]. Darke J, Bushby K, Le Couteur A, McConachie H. Survey of behaviour problems in children with neuromuscular diseases. Eur J Paediatr Neurol. 2006 May. 10(3):129-34. [Medline]. Mendell JR, Shilling C, Leslie ND et al. Evidence based path to newborn screening for Duchenne Muscular Dystrophy. Ann Neurology. 2012. 71:304–313. [Medline]. Rodino-Klapac LR, Chicoine LG, Kaspar BK, Mendell JR. Gene therapy for duchenne muscular dystrophy: expectations and challenges. Arch Neurol. 2007 Sep. 64(9):1236-41. [Medline]. Merlini L, Gennari M, Malaspina E et al. Early corticosteroid treatment in 4 duchenne muscular dystrophy patients: 14-year follow-up. Muscle Nerve. 2012 Jun. 45(6):796-802. American Academy of Pediatrics Section on Cardiology and Cardiac Surgery. Cardiovascular health supervision for individuals affected by Duchenne or Becker muscular dystrophy. Pediatrics. 2005 Dec. 116(6):1569-73. [Medline]. Colan SD. Evolving therapeutic strategies for dystrophinopathies: potential for conflict between cardiac and skeletal needs. Circulation. 2005 Nov 1. 112(18):2756-8. [Medline]. Markham LW, Kinnett K, Wong BL, Woodrow Benson D, Cripe LH. Corticosteroid treatment retards development of ventricular dysfunction in Duchenne muscular dystrophy. Neuromuscul Disord. 2008 May. 18(5):365-70. [Medline]. Duboc D, Meune C, Pierre B, Wahbi K, Eymard B, Toutain A, et al. Perindopril preventive treatment on mortality in Duchenne muscular dystrophy: 10 years' follow-up. Am Heart J. 2007 Sep. 154(3):596-602. [Medline]. Rhodes J, Margossian R, Darras BT et al. Safety and efficacy of carvedilol therapy for patients with dilated cardiomyopathy secondary to muscular dystrophy. Pediatr Cardiol. 2008 Mar. 29(2):343-51. [Medline]. Spurney CF. Cardiomyopathy of Duchenne muscular dystrophy: current understanding and future directions. Muscle Nerve. 2011 Jul. 44(1):8-19. [Medline]. Buyse GM, Goemans N, van den Hauwe M et al. Idebenone as a novel, therapeutic approach for Duchenne muscular dystrophy: results from a 12 month, double-blind, randomized placebo-controlled trial. Neuromuscul Disord. 2011 Jun. 21(6):396-405. [Medline]. Quinlivan R, Roper H, Davie M, Shaw NJ, McDonagh J, Bushby K. Report of a Muscular Dystrophy Campaign funded workshop Birmingham, UK, January 16th 2004. Osteoporosis in Duchenne muscular dystrophy; its prevalence, treatment and prevention. Neuromuscul Disord. 2005 Jan. 15(1):72-9. [Medline]. Apkon S, Coll J. Use of weekly alendronate to treat osteoporosis in boys with muscular dystrophy. Am J Phys Med Rehabil. 2008 Feb. 87(2):139-43. [Medline]. Granchelli JA, Pollina C, Hudecki MS. Pre-clinical screening of drugs using the mdx mouse. Neuromuscul Disord. 2000 Jun. 10(4-5):235-9. [Medline]. Escolar DM, Zimmerman A, Bertorini T et al. Pentoxifylline as a rescue treatment for DMD: a randomized double-blind clinical trial. Neurology. 2012 Mar. 78(12):904-13. [Medline]. Kirschner J, Schessl J, Schara U, Reitter B, Stettner GM, Hobbiebrunken E, et al. Treatment of Duchenne muscular dystrophy with ciclosporin A: a randomised, double-blind, placebo-controlled multicentre trial. Lancet Neurol. 2010 Nov. 9(11):1053-9. [Medline]. Bushby K, Finkel R, Birnkrant DJ et al. Diagnosis and management of Duchenne muscular dystrophy, part 1: diagnosis, and pharmacological and psychosocial management. Lancet Neurol. 2010 Jan. 9(1):77-93. [Medline]. Bushby K, Finkel R, Birnkrant DJ et al. Diagnosis and management of Duchenne muscular dystrophy, part 2: implementation of multidisciplinary care. Lancet Neurol. 2010 Feb. 9(2):177-89. [Medline]. Finder JD, Birnkrant D, Carl J, Farber HJ, Gozal D, Iannaccone ST, et al. Respiratory care of the patient with Duchenne muscular dystrophy: ATS consensus statement. Am J Respir Crit Care Med. 2004 Aug 15. 170(4):456-65. [Medline]. Wang B, Li J, Xiao X. Adeno-associated virus vector carrying human minidystrophin genes effectively ameliorates muscular dystrophy in mdx mouse model. Proc Natl Acad Sci U S A. 2000 Dec 5. 97(25):13714-9. [Medline]. Seto JT, Ramos JN, Muir L, Chamberlan JS, Odom JL. Gene Replacement Therapies for Duchenne Muscular Dystrophy Using Adeno-Associated Viral Vectors. Curr Gene Ther. 2012 Apr 25. [Epub ahead of print]:[Medline]. Bowles DE, McPhee SW, Li C et al. Phase 1 gene therapy for Duchenne muscular dystrophy using a translational optimized AAV vector. Mol Ther. 2012 Feb. 20(2):443-55. [Medline]. Colussi C, Gaetano C, Capogrossi MC. AAV-dependent targeting of myostatin function: follistatin strikes back at muscular dystrophy. Gene Ther. 2008 Aug. 15(15):1075-6. [Medline]. Fakhfakh R, Michaud A, Tremblay JP. Blocking the myostatin signal with a dominant negative receptor improves the success of human myoblast transplantation in dystrophic mice. Mol Ther. 2011 Jan. 19(1):204-10. [Medline]. Fakhfakh R, Lee SJ, Tremblay JP. Administration of a soluble Activin type IIb receptor promotes the transplantation of human myoblasts in dystrophic mice. Cell Transplant. 2012 Mar 22. [Epub ahead of print]:[Medline]. Markert CD, Ambrosio F, Call JA, Grange RW. Exercise and Duchenne muscular dystrophy: toward evidence-based exercise prescription. Muscle Nerve. 2011 Apr. 43(4):464-78. [Medline]. Aartsma-Rus A, Bremmer-Bout M, Janson AA, et al. Targeted exon skipping as a potential gene correction therapy for Duchenne muscular dystrophy. Neuromuscul Disord. 2002 Oct. 12 Suppl 1:S71-7. [Medline]. Barber BJ, Andrews JG, Lu Z, West NA, Meaney FJ, Price ET, et al. Oral corticosteroids and onset of cardiomyopathy in duchenne muscular dystrophy. J Pediatr. 2013 Oct. 163(4):1080-1084.e1. [Medline]. Barkhaus PE, Gilchrist JM. Duchenne muscular dystrophy manifesting carriers. Arch Neurol. 1989 Jun. 46(6):673-5. [Medline]. Beaudet A. Molecular genetics and medicine. Harrison's Principles of Internal Medicine. 12th ed. 1991. 33. Bogdanovich S, Perkins KJ, Krag TO. Therapeutics for Duchenne muscular dystrophy: current approaches and future directions. J Mol Med. 2004 Feb. 82(2):102-15. [Medline]. Brooke M. Disorders of skeletal muscle. Neurology Clinical Practice. 3rd ed. 2000. 2: 2194-2198. Clemens PR, Fenwick RG, Chamberlain JS, et al. Carrier detection and prenatal diagnosis in Duchenne and Becker muscular dystrophy families, using dinucleotide repeat polymorphisms. Am J Hum Genet. 1991 Nov. 49(5):951-60. [Medline]. Cossu G, Sampaolesi M. New therapies for Duchenne muscular dystrophy: challenges, prospects and clinical trials. Trends Mol Med. 2007 Dec. 13(12):520-6. [Medline]. Davies KE. Challenges in Duchenne muscular dystrophy. Neuromuscul Disord. 1997 Dec. 7(8):482-6. [Medline]. Dent KM, Dunn DM, von Niederhausern AC, et al. Improved molecular diagnosis of dystrophinopathies in an unselected clinical cohort. Am J Med Genet A. 2005 Apr 30. 134(3):295-8. [Medline]. Engel A, Yamamoto M, Fischbeck K. Muscular dystrophies. Engel A, Franzini-Armstrong C, eds. Myology. 2nd ed. 1994. 2: 1130-1187. Gowers WR. A manual of Diseases of the Nervous System. 1888. 378-393. Harper SQ, Hauser MA, DelloRusso C, et al. Modular flexibility of dystrophin: implications for gene therapy of Duchenne muscular dystrophy. Nat Med. 2002 Mar. 8(3):253-61. [Medline]. Hoffman EP, Brown RH, Kunkel LM. 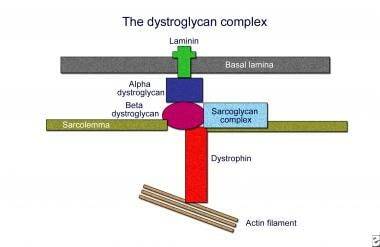 Dystrophin: the protein product of the Duchenne muscular dystrophy locus. Cell. 1987 Dec 24. 51(6):919-28. [Medline]. Howard MT, Anderson CB, Fass U. Readthrough of dystrophin stop codon mutations induced by aminoglycosides. Ann Neurol. 2004 Mar. 55(3):422-6. [Medline]. Matthews PM, Benjamin D, Van Bakel I, et al. Muscle X-inactivation patterns and dystrophin expression in Duchenne muscular dystrophy carriers. Neuromuscul Disord. 1995 May. 5(3):209-20. [Medline]. Mendell JR, Moxley RT, Griggs RC, Brooke MH, Fenichel GM, Miller JP, et al. Randomized, double-blind six-month trial of prednisone in Duchenne's muscular dystrophy. N Engl J Med. 1989 Jun 15. 320(24):1592-7. [Medline]. Pascuzzi RM. Early observations on muscular dystrophy: Gowers' textbook revisited. Semin Neurol. 1999. 19(1):87-92. [Medline]. Pegoraro E, Schimke RN, Garcia C. Genetic and biochemical normalization in female carriers of Duchenne muscular dystrophy: evidence for failure of dystrophin production in dystrophin-competent myonuclei. Neurology. 1995 Apr. 45(4):677-90. [Medline]. Siddique N, Sufrit R, Siddique T. Degenerative motor, sensory, and autonomic disorders. Goetz C, Pappert E eds. Textbook of Clinical Neurology. 1999. 704. Tidball JG, Wehling-Henricks M. Evolving therapeutic strategies for Duchenne muscular dystrophy: targeting downstream events. Pediatr Res. 2004 Dec. 56(6):831-41. [Medline]. Wilton SD, Fletcher S. Antisense oligonucleotides in the treatment of Duchenne muscular dystrophy: Where are we now?. Neuromuscul Disord. 2005 Jun. 15(6):399-402. [Medline]. Yan J, Feng J, Buzin CH. Three-tiered noninvasive diagnosis in 96% of patients with Duchenne muscular dystrophy (DMD). Hum Mutat. 2004 Feb. 23(2):203-4. [Medline]. The authors and editors of Medscape Reference gratefully acknowledge the contributions of previous author James M Gilchrist, MD and coauthor Brian S Tseng, MD, PhD to the development and writing of this article.